Motorsport has always been Matt Speakman’s passion. On a happy morning in 1993 he signed a deal to compete on two wheels in the Australian 600 Super Sport Championship. Tragically that evening a drunk driver ended this fledgling career knocking Matt off his road bike – an accident that left him a paraplegic. However Matt’s spirit and ambitious nature were undaunted and his motorsport ambitions soon returned, this time focussed on four wheels. His success here has been even more impressive. “…my long term goal is to travel to Europe and race in the Porsche Supercup. And I know I will do it” says Matt. In 2012 he won the Queensland Under 1600 Improved Production championship using hand controls against able bodied drivers – the first time in Australia that someone with a spinal cord injury has become a state champion in an open sport! 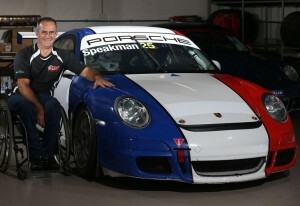 Matt now has a place on the Porsche racing team competing in the GT3 Cup. As a SpinalCure Ambassador, Matt’s car is adorned with the SpinalCure logo and he is making good use of the well deserved publicity to promote our cause. Matt is the perfect example of someone living life to the fullest, despite their disability, while still enthusiastically looking forward to a time when a cure will make that disability a thing of the past.